StoryCorps recognizes the profound historical importance of capturing the stories of the LGBTQ community and the urgent need for this work to happen now. 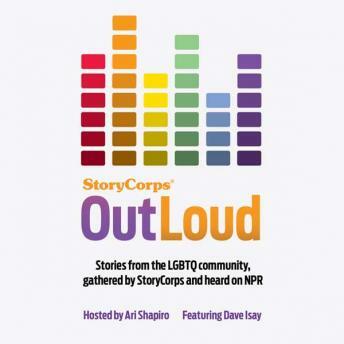 StoryCorps OutLoud is a multi-year initiative dedicated to recording and preserving LGBTQ stories across America.OutLoud honors the stories of those who lived before the 1969 Stonewall uprisings, celebrates the lives of LGBTQ youth, and amplifies the voices of those most often excluded from the historical record. The end result is a diverse collection of stories that enriches our nation's history. StoryCorps OutLoud sets out across the country to record and preserve the stories of LGBT individuals, along with their families and friends. OutLoud is a project undertaken in the memory of Isay's father, psychiatrist Dr. Richard Isay. Professionally credited for helping to persuade the mental health community that homosexuality is not a mental disorder, Dr. Isay was himself a closeted gay man for many years. He came out to his son at the age of 52 and, in 2011, he married his partner of 31 years, Gordon Harrell, before passing away suddenly from cancer on June 28, 2012. On June 28, 2014, the 45th anniversary of the Stonewall uprising, StoryCorps inaugurated OutLoud, a three-year project to capture the experiences of L.G.B.T.Q. people. In particular, the project will seek stories from young people, minorities and those who lived before the uprising, which was a response by gays to a police raid on the Stonewall Inn in Greenwich Village and helped precipitate the gay rights movement.